Do you have money or property that you don’t want to be taxed on? Maybe taxes aren’t the issue, you just genuinely want to do something nice for a friend or family member. How about using a good old fashioned gift? After all, giving away your property saves you from paying income taxes on the income generated by the property, and the receiver is harmless from being taxed on it because it is, after all a gift…right? Well, not so fast. The gift tax makes just giving assets to family a much tougher situation. You couldn’t believe that Uncle Sam would let family members just gift assets from person to person while evading any tax penalties on it. The gift tax actually was started to prevent people who tried to avoid the estate tax, from giving out their assets to others just before they passed away. 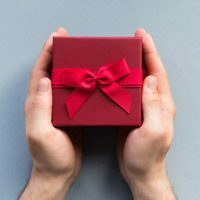 The giver, not the receiver of the property pays the gift tax, and the tax does apply to gifts to family members, although gifts to spouses may qualify for other exemptions that make those kinds of gifts a bit easier. Gifts are not taxable up to $14,000 per person per year in 2017. Additionally, each individual can gift up to $5.49 million in 2017 on top of the $14,000 per person without paying any gift tax. That means that someone could gift tax free to multiple people for an aggregate of way above $14,000. Above that the $14,000 per person, the gifts eat into the giver’s $5.49 million. If total gifts exceed the $5.49 million, gift tax will then be due. One kind of gift that is often not counted towards the gift tax limit, and which can make a great asset protection or tax exemption vehicle, is a gift that is for medical care or education. However, the payments must be made to qualifying institutions. For example, “gifting” your uncle money to visit the chiropractor will not qualify. Because the giver pays the gift tax, you may wonder why contest or promotion winners are taxed on their winnings. Some years ago, an entire studio audience on the Oprah Winfrey show were all given new cars. There was elation and excitement, until the audience members realized they all had to pay income taxes on the car, or lose it. The reason the gift tax didn’t make Oprah or Pontiac pay the tax is that the cars were not considered gifts because the giver—the show—received a benefit in the form of promotion. The cars also qualified as income for the purpose of income tax. Remember that even if the receiver doesn’t have to pay the gift tax, the gift still may qualify as income for the purpose of income tax. Some husbands and wives who were at the show together received two cars, and thus double the tax. Of course, another way of looking at it was receiving a new car for the roughly $7,000 tax, which still comes out to a good deal for those who could pay it. Make sure your assets go as far as you need them to in your estate plan and aren’t eaten up by taxes or creditors. Contact Tampa asset protection and estate attorney David Toback to discuss your estate plans.